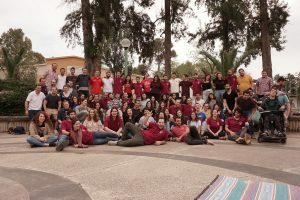 Around 160 young political activists at the age of 18-35, met for a two-day seminar at the educational centre of the kibbutz movement Givat Haviva to reflect on the past year of HeChalutz, plan further activities and educate themselves in the Zionist-social-democratic spirit. 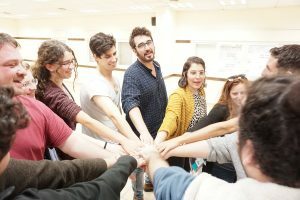 HeChalutz is a movement of young people who proactively promote the values of humanist Zionism and social democracy in their social environment. 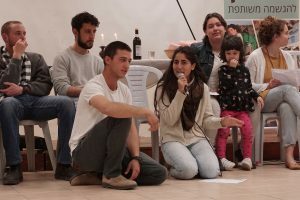 These young people join together in several communes and other groups throughout the country, continue their political education and thus have an impact on Israeli civil society on a daily basis. At the same time, it’s a goal of the participants to get into key positions in politics, economy, public service, security and education, as well as in the non-governmental sector of the country, in order to be able to exert influence from there in the sense of their values. HeChalutz is an old-new movement. In the 20s and 30s of the last century it was an important pillar of the Zionist movement. The Shoah put an abrupt end to all this. In 2009 the first attempt was made to revive this movement and to adapt it to the Israel of the 21st century. The success was overwhelming. HeChalutz now has hundreds of members and thousands of young people took part in the educational programs of this movement. Since 2019 the FES has been a companion of HeChalutz. 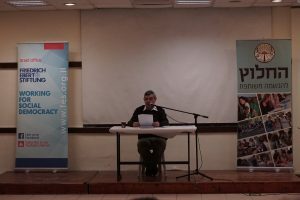 Micky Drill, project manager at FES-Israel, reported on the FES’ philosophy of life and work in Israel and on a global level, spoke about the values of social democracy and emphasized the importance of international cooperation among all progressive forces. The FES is proud to have partnered with HeChalutz.